While I was photographing these sticky bars, I had a little helper. Usually I photograph during nap time or up on a table out of reach. I wanted to try some different lighting, so I placed my setup on the floor this time. Well, a little helper saw a chance a thought a caramel spoon looked good. Do you spy a chubby, little hand in the picture below. I think it’s awful cute, even though he was causing trouble. I think I’ll only try shooting on the floor when he is asleep. I do like the light there though. 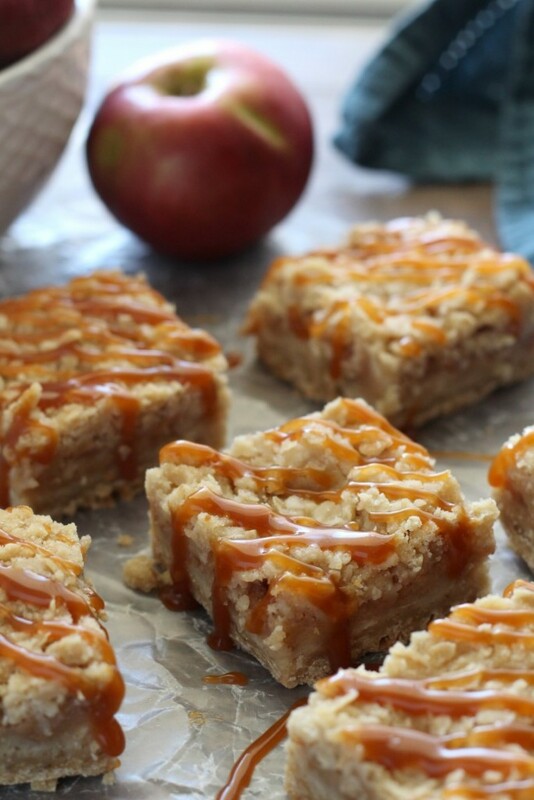 These taste exactly like an apple crumb pie, only with more of that delicious crumb topping. 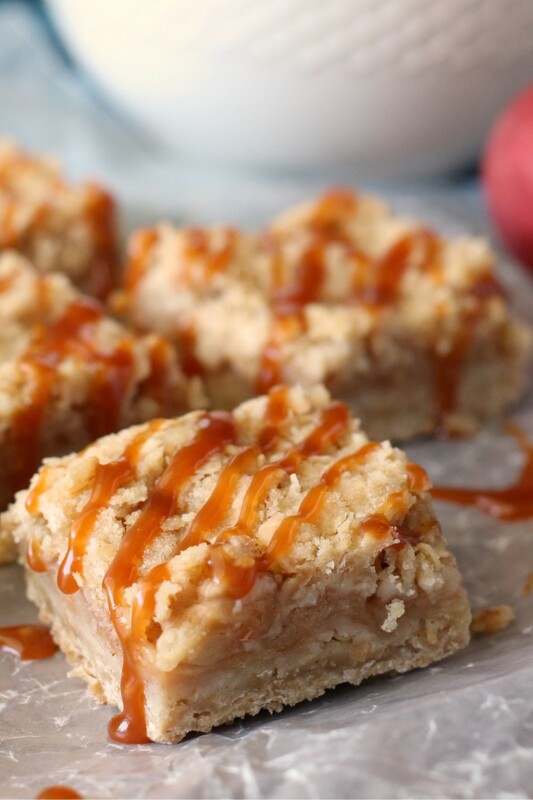 There is not an overwhelming amount of caramel in these, just enough to give it some flavor. 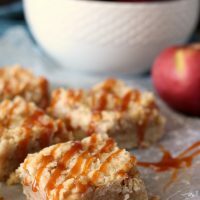 Feel free to use store bought caramel or be adventurous and make your own, it really is easy and tastes better. I use this recipe. Melt the sugar in a saucepan and whisk in butter and heavy cream, definitely not health food, but easy peasy. Preheat oven to 350 F. In a large bowl, whisk together the flour, oatmeal, and brown sugar, cut in the cold butter with a pastry blender until pea sized. Reserve 2 cups of the crumb mixture. Press the remaining mixture into the bottom of a greased 9 x 13 inch pan. Crust will be crumbly. Set aside. Dice the apples and toss with the sugar, cinnamon and nutmeg. Arrange apples over the top of the crust. 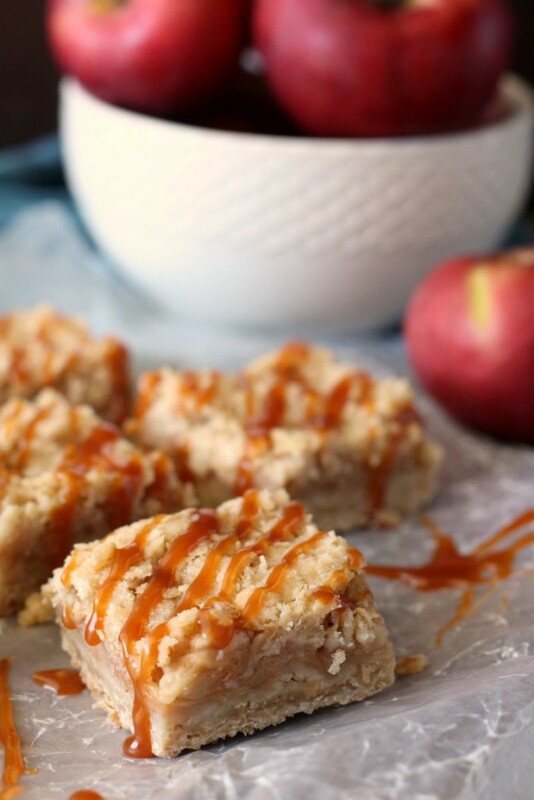 Drizzle 1/3 cup of caramel sauce over the apples. Top with the remaining crumb mixture. Bake at 350 F for 40-45 minutes or until apples are tender and crust is lightly browned. 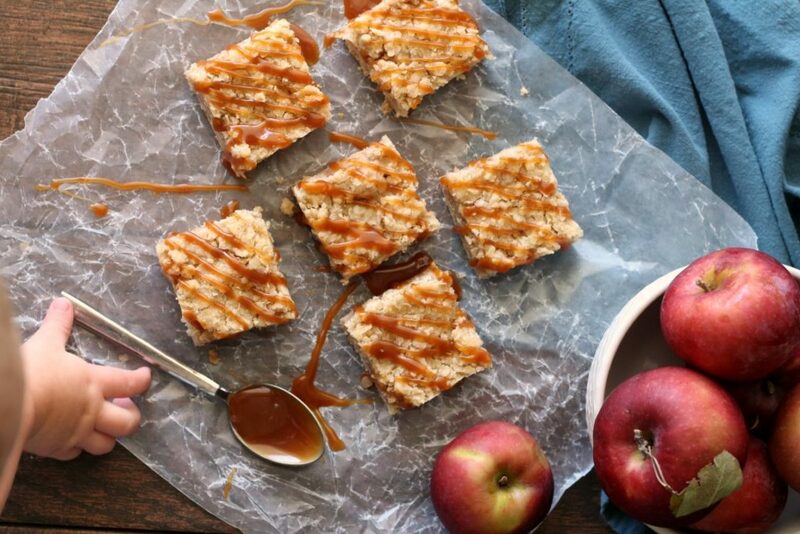 Let cool completely, drizzle with remaining caramel sauce and cut into bars. Store in the refrigerator. If you’re a cheesecake fan like me, I’ve also been eyeing these Caramel Apple Cheesecake Bars from the Girl Who Ate Everything. 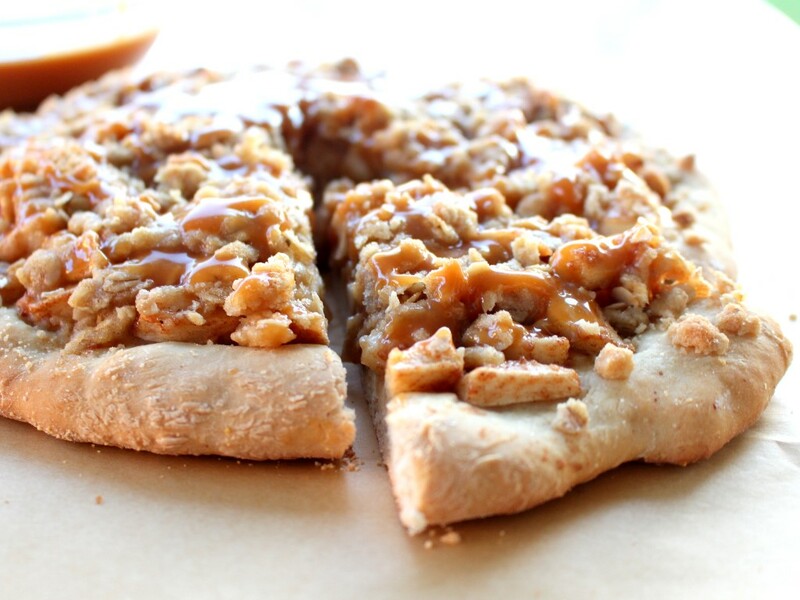 Also, give this Caramel Apple Dessert Pizza a try.